The smallest changes to your manure management system can have a significant impact on the state of our environment and communities. If any of the above might apply to your system, take a look below at the simple changes you can make to ensure the health of the environment and your local community. 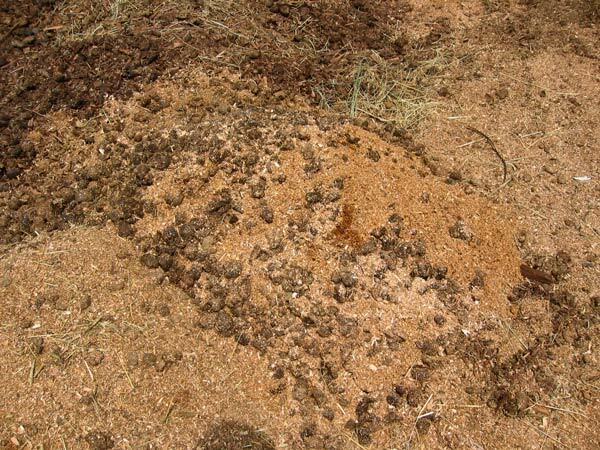 Manure piles must be covered at all times to ensure that leachate does not escape from the pile/system and contaminate ground and surface waters. 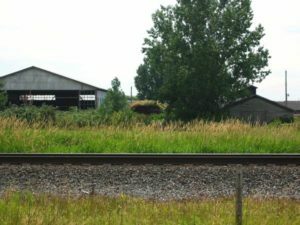 In this photo you can clearly see grass growing on the manure pile, indicating that it has been there, unmanaged and uncovered, for a long period of time. 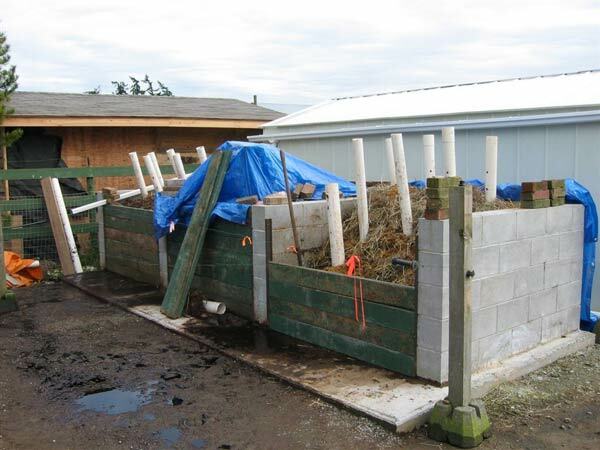 In the province of BC, manure can be “field stored” in piles for up to nine months and must be covered. 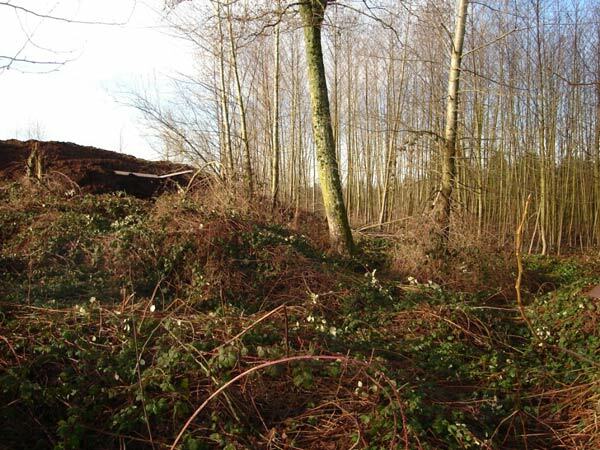 On a number of site consultations, we have seen piles as old as 10 years sitting in fields. Spread your compost piles during the allowed months so that you can take advantage of those available nutrients. 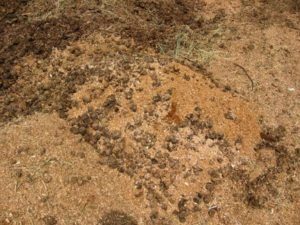 Many manure piles are left to manage themselves. Though some breakdown may occur, in order to produce a quality compost product, it is essential to manage the pile so that conditions are optimal for quick decomposition. 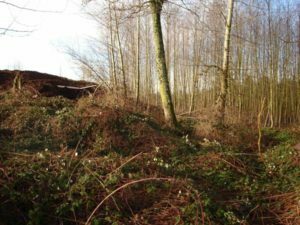 Check out the Land Management Guide for simple things you can do to make sure your pile composts optimally, or visit the managing your compost section. It is important to check your local regulations regarding the distance between watercourses such as streams and lakes and manure storage areas. It is also important to check what type of watercourse you have on your property if you have one. In many cases, what may appear to be a drainage ditch to you, is a classified stream important to providing fish food for fish downstream. We have been on a number of properties where this has been the case so prior to building your dream compost system, make sure it can actually go where you want it to. Otherwise you may end up having the expense of moving it! You also need to check local regulations about distance from wells or water used for domestic purposes. This is particularly important if your well is not very deep. In Langley, compost systems must be at least 30m from any potable water source and at least 15m from additional water courses. Though you may have the best of intentions to create a good quality compost, you may not have the right ingredients to do so. 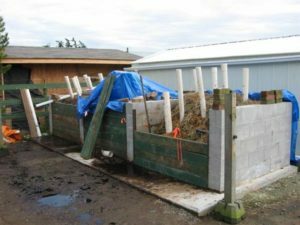 Too much carbon is a common problem when making horse manure compost and if you have too much, your raw materials will not degrade well, if at all. Check our troubleshooting guide for more information. In the province of BC, raw manure cannot be spreading during the months of October to April when fields tend to be wet and so the possibility of leachate contamination is high. Consult your local regulations to ensure you are spreading during the allowed time of year. Note that it is always better to spread composted manure rather than raw manure as properly made compost, will retain nutrients and store them like a bank until plants require them whereas raw manure will leach nutrients easily and so will not be as available to your plants. In this photo you can notice at the base of the system liquid leaking out and onto the ground. Though regulations do not necessarily require manure be stored in a sealed site, it is an important consideration because it is the only way to ensure that your pile is not leaching (leaking contaminated liquids). Leaching can be extremely harmful to the environment and can have dangerous effects on drinking water, and human and animal health. As much as one would like to think this doesn’t happen, it does! In one case a lady that was doing this told us she thought she was returning the nutrients back to where they came from. Honest ignorance is no excuse! Dumping deleterious substances into watercourses is against the law and fines surrounding this infraction can be substantial. Keep your manure out of watercourses! Another common practice we have seen is dumping manure into low spots to level properties. Not a good idea! Not only can this have catastrophic effects on property drainage as that low spot may be serving an important function, but manure mixed with shavings behaves more like a wet sponge, potentially creating sink holes on your property. Leveling with manure can also release leachate into the environment. Get professional help for leveling, and use proper fill. The Province of British Columbia’s Agricultural Waste Control Regulation can be referenced to better understand the protocols associated with manure management. This along with other resources can be found on the additional resources page.